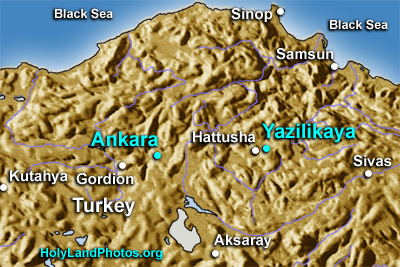 The Hittite site of Yazilikaya (= "Inscribed Rock") is located 1.25 mi. [2 km.] northeast of the Hittite capitol of Hattusha. It was evidently a sacred place constructed during the reign of the Hittite king Tudhaliya IV (1250–1220 B.C.). It is composed of an initial sanctuary, and three chambers, labeled A, B, and C. Only Chamber A and Chamber B are open to the public and the rock walls of each of these open air chambers are lined with carved reliefs of gods, goddesses, and kings.